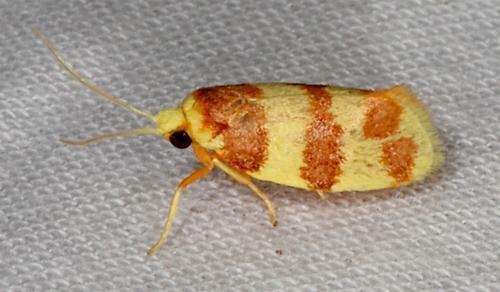 The adult moth of this species has forewings which are orange-brown, each crossed by two broad ragged yellow bands, and with a narrow yellow band along the margin. The hindwings are orange shading darker at the wingtips. The wingspan is about 2 cms. Volume 53 (1942), p. 95.